Who enjoys fried chicken? I know I do! And this recipe makes a wonderful and tasty fried chicken. Mine turned out a little darker, most likely due to me failing to have any cayenne on hand when we made it, causing the use of a substitute spice. 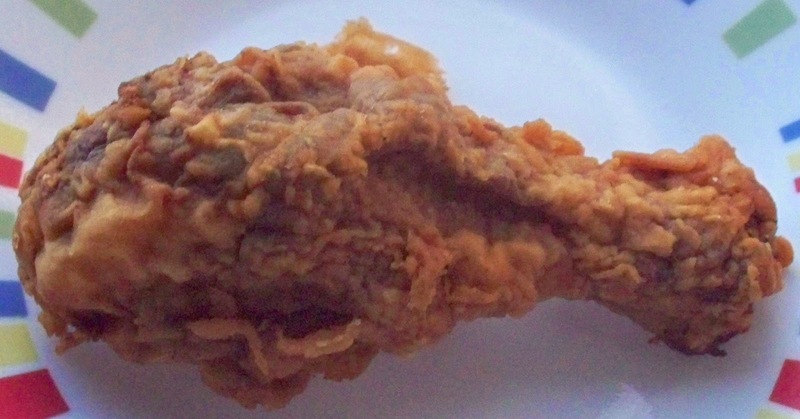 It is not safe to be a singular piece of fried chicken in our house. This one didn't last long that is for sure. 3 lbs bone-in chicken pieces. Mix together buttermilk, hot sauce, 1 Tbsp salt, and 1 Tbsp pepper. Lay the chicken in a single layer in a dish just large enough to for it all to fit and pour the buttermilk brine over it. Cover the chicken and refrigerate for at least 3 hours, flipping the chicken 1/2 way through. Drain the brine from the chicken. In a resealable plastic bag, add the remaining non-oil ingredients. With 2 or 3 chicken pieces at a time, put them into the bag and give it a good shake. Remove the chicken and shake off any excess flour. Store the chicken on a wire rack until you cook them. Heat about 2 inches of canola oil to 350 degrees in a deep skillet. I recommend using some form of cooking thermometer to make sure that the temperature reaches the correct level and stays there. Cook the chicken in a single layer in the hot oil for 14-18 minutes, flipping 1/2 way through. Remove the chicken to a wire rack with something underneath to keep any drippings from making a mess of your counters. Let chicken rest for 5 to 10 minutes before serving.